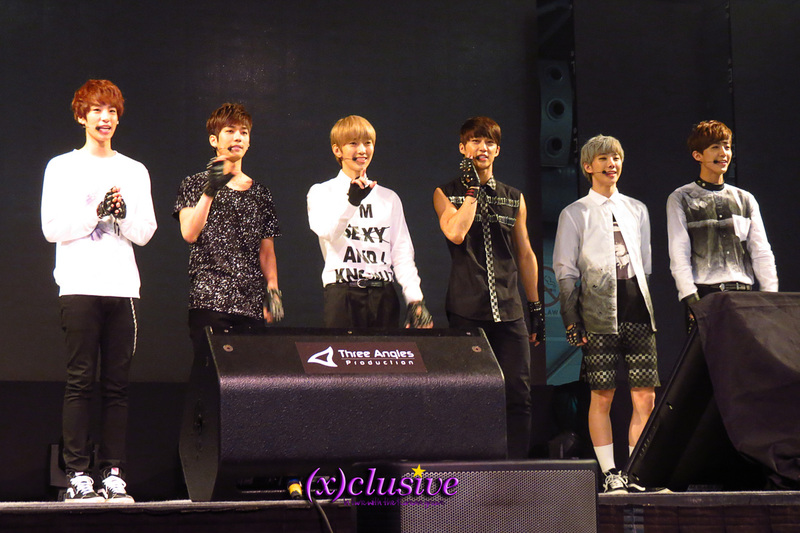 On the last day of Korea Festival 2013 – Vizit Korea, held at the Singapore Expo, A-JAX put on an exciting showcase for their fans (completed with a Hi-Five session and an encore). But before our coverage of A-JAX’s exciting showcase, (x)clusive would like to share with our readers an exclusive interview held with the boys before their performance yesterday evening. Read on to find out more! Greeting the small group of social media in the room, the boys of A-JAX, consisting of Hyeongkon, Jaehyung, Yunyoung, Hyojun, Seungjin and Seungyub (member Sungmin was injured and was not present at the showcase), were all in smiles when they introduced themselves, stating their names and the roles they are in-charge of in the group. As this was A-JAX’s first visit to Singapore, Leader Hyeongkon stated that they were really happy to be here. This was also their first time performing six songs for their fans, thus they were glad to be able to introduce K-pop to the world. Having debuted more than a year ago, Jaehyung shared that when they were rookies, all they focused on was working really hard and practicing whatever they needed. However, as time goes by, they learnt the importance of enjoying while performing and the art of interaction with their fans. When asked which member in A-JAX they would like to be if they could exchange bodies for a day, Leader Hyeongkon answered that he would choose either Seungjin or Seungyub. That was because he felt that being the hyung (T/N: older brother) in the group was hard work. As such, he really wanted to be younger. Since Seungjin and Seungyub are the maknae line in A-JAX, he chose them without hesitation. Curious about which musical instruments A-JAX would be interested in learning and their thoughts on composing their own tracks? Lead vocalist Yunyoung picked the violin because he really liked it. He also added on that if he had the opportunity, he would like to give a shot at composing as well. How could we leave out the topic on snakes when their comeback track is titled Snake and the members are now involved in a new reality programme called ‘A-JAX’s Snake Parenting Diaries’? 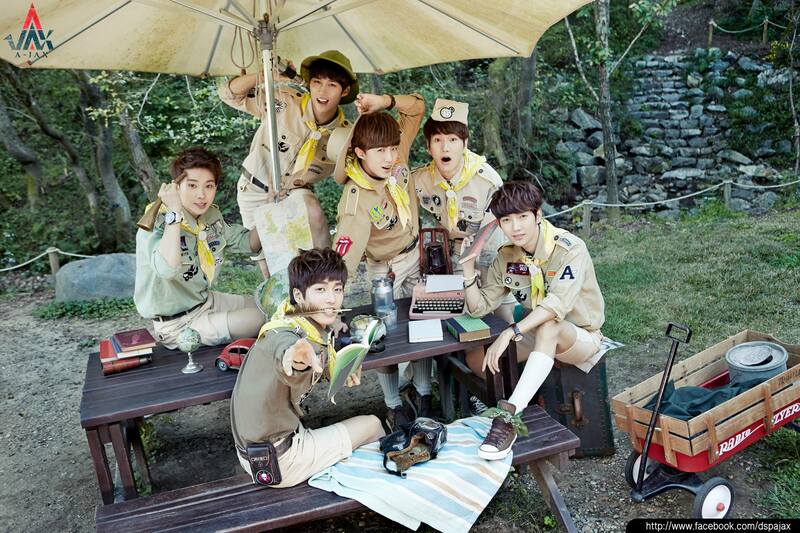 Seungyub shared that when they first came into contact with the snake, they were undeniably really scared. However, as they started to take care of it and spend more time with the snake, the boys are on friendly terms with their new pet now. On which male idol they would like to date if they were a girl, the boys were slightly stumped, before breaking out into laughter. In the end, Seungjin answered the question, stating the if he was a girl, he would like to date Park Jaebom (Jay Park) as he really looks up to him. They were then asked if they had any interesting personal habits. Hyeongkon revealed that Seungjin talks in his sleep, which shocked the members initially. Last but not least, on their favourite songs out of the ones they had released, Yunyoung mentioned that he liked Insane the best because “it has an addictive chorus and it’s a tune that the audience would like”. With that, the interview had come to an end as the boys gave their thanks and waved goodbyes, moving on for their last bit of preparations before their showcase starts. If you want to find out what happened during the showcase, do stay tuned! A big thank you to CJ E&M for the group interview opportunity! For more photos on A-JAX’s showcase at Vizit Korea, do keep tabs and ‘like’ (x)clusive’s Facebook! ← (x)clusive! : A-Pink brings happiness to Pink Pandas and says NoNoNo sadness at Vizit Korea 2013! Girls’ Generation Concert in Singapore date out – 9,10 Dec!